In preparing for the April 19th house concert with Old Buck I did my typical research of the artists. As I read about Riley Baugus I was reminded of my 2007 listening addiction to the Raising Sand release by Robert Plant and Alison Krauss. Now I hear a random song from this album on the radio or from the iPod shuffle, but there’s something to be said for listening to an album in its entirety, with the songs in the order that the producer intended. So last week I listened to Raising Sand in a way that I had not listened for years, and was rewarded with Riley Baugus on banjo on the final track “Your Long Journey”. 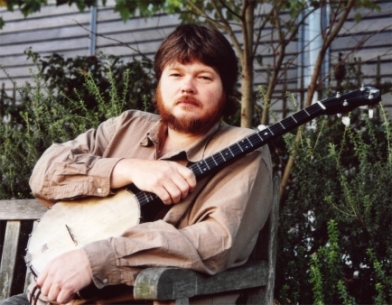 This rendition of a favorite Doc Watson/Rosa Lee Watson tune includes Norman Blake on acoustic guitar and Mike Seeger on autoharp. Riley has two solo projects Life of Riley and Long Steel Rail, and has collaborated on over 20 albums including That’s How We Run, with April Verch who performed at Chestnut House Concerts in January 2013. In 2003 Riley loaned not only his banjo playing and vocal talents to the Cold Mountain movie soundtrack, but his handmade banjos built in the style of the Civil War era made it into the picture as well. Riley will be joined on stage with Emily Schaad (fiddle), Sabra Guzmán (bass) and Debra Clifford (guitar) at 7:00 p.m. at Chestnut House Concerts. As tradition at our house concert series there will be a potluck at 6:00 p.m. before the show begins. Suggested donation at the door of $15/20 per person. You do need to RSVP to attend by calling/texting 717-940-9311 or by sending an email to Tim at tlehman9@gmail.com. Find out more about the workshops that will be held from 3:00 pm – 4:30 pm by reading my previous post Catch the Synergy. Attending the workshops does not automatically sign you up for the house concert. This entry was posted in For Your Information, Music Workshops, Upcoming House Concert and tagged Alison Krauss, April 19 2014, April Verch, banjo, Cold Mountain, Debra Clifford, Emily Schaad, It's Modern Art, Raising Sand, Riley Baugus, Robert Plant, Sabra Guzman by chestnuthouseconcerts. Bookmark the permalink.